The connection between type 2 diabetes and cancer is complex, involving both genetic and lifestyle factors. 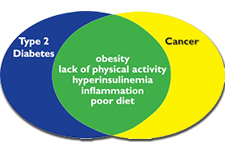 The two diseases - diabetes and cancer - share several key risk factors, including obesity and lack of physical activity. Excess body fat can lead to isulin resistance, a risk factor for type 2 diabetes. It also can trigger chronic inflammation, and increased estrogen production which, along with insulin resistance are key contributing factors in the development of tumorous cells. These connections are the focus of a new study published in The Lancet Diabetes and Endocrinology. The researchers looked at data on 12 types of cancer from 175 countries and found approximately six percent of new cancer cases worldwide (nearly 800,000) in 2012 were caused by the combined effects of diabetes and overweight or obesity. Among individual risk factors, overweight was responsible for twice as many cancers (3.9 percent) as diabetes (2 per cent). AICR research shows that adults with diabetes have about twice the risk of developing cancers of the liver, pancreas, and endometrium. There's a clear but smaller increase in risk for colon and breast cancers. Diabetes affects one of every ten American adults. A strong body of evidence now suggests that people with type 2 diabetes are at increased risk of developing several cancers. Researchers relied on AICR's CUP (Continuous Update Project) reports to conclude that causal association exists between high BMI and these cancers: colorectal, gallbladder, pancreatic, liver, postmenopausal breast, endometrial, kidney, ovarian, gastric cardia, and esophageal adenocarcinoma. Thyroid Cancer and multiple myeloma were also included in response to new data from International Agency for Research on Cancer (IARC). The researchers quantified the contribution of diabetes and high BMI to site-specific cancers. Using prevalence estimates for diabetes and BMI categories from 2002 (to account for the assumed 10-year lag between exposure to diabetes or high BMI and incidence of cancer) and relative risks for their association with each cancer from published meta-analyses. They analyzed data individually for diabetes and high BMI and diabetes and high BMI combined. The two factors combined accounted for a quarter of liver cancers and more than a third of all endometrial cancers worldwide. "While obesity has been associated with cancer for some time, the link between diabetes and cancer has only been established recently. Our study shows that diabetes, either on its own or combined with being overweight, is responsible for hundreds of thousands of cancer-cases each year across the world," said Dr. Jonathan Pearson-Stuttard in a press release. 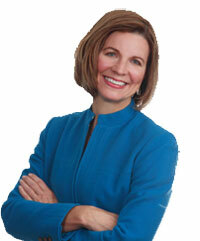 Pearson-Stuttard is the lead author of the study and is based at School of Public Health, Imperial College, in London. In men, liver cancer was the most common cancer caused by diabetes and high BMI, accounting for 126,700 cases, and colorectal cancer was second, accounting for 63,200 of cancer cases. In women, 147,400 breast cancer cases constituted 29.7% of all cancers attributable to diabetes and high BMI. Endometrial cancer was second, accounting for 121,700 new cancer cases or 24.5 per cent or all diabetes and high BMI related cancers. Some disparities emerged between high-income and low-income countries. Although the number of cancer cases attributable to diabetes and high BMI were higher in high-income western countries (38.2 percent), the largest increases from 1998 to 2002, in cancers associated with these risk factors, were seen in low and middle-income countries. The statistics on low-income countries are particularly revealing "because these countries are generally less well equipped to manage the burden of complex non-communicable diseases than high-income countries," the authors noted. The study notes that if global rates of diabetes and overweight continue to rise, the share of cancers attributable to combined factors will increase by over 30% in women and by 20% in men by 2035. Lead author Dr. Pearson-Stuttard observed that in the past, smoking was by far the major risk factor for cancer, but now healthcare professionals should also be aware that patients who have diabetes or overweight/obesity also have an increased risk of cancer. More than a third of American adults are now living with prediabetes - with the majority unaware they have the condition - according to a new government report that can offer fresh motivation for millions to not only lower their risk of developing diabetes but also of cancer. The study was supported by the National Institute for Health Research (NIHR) and the Wellcome Trust. Source: Pearson-Stuttard, Jonathan et al. Worldwide burden of cancer attributable to diabetes and high body-mass index: a comparative risk assessment. The Lancet Diabetes & Endocrinology. Volume 6, Issue 2, 95-104.